Lynk is a unified web platform concept for public health communication that is accessible by the general public, the CDC, and medical professionals. Each of the three parties can access Lynk through their own portals and thus only deal with information that is relevant to them. It is designed to improve communication channels in order to respond to pandemic situations more effectively. Four MHCI+D graduate students created Lynk as a final project in Ideation Studio. Each member of the team was involved in all stages of the project, from research to concept refinement and presentation. I was independently responsible for the storyboards, mood boards, experience map visualization, and thumbnail sketches. The project’s overall theme was ‘pandemics’ in the context of Ebola outbreaks in rural US settings. By researching the topic in this context and consulting a subject matter expert (SME), Dr. Phil Green, we were able to identify specific problem areas in the health-care system and come up with solutions to help manage pandemic situations more effectively. We started off by consulting a subject matter expert for first-hand information about the kind of problems encountered by hospital staff during a pandemic. Dr. Philip Green has been an emergency physician for over 15 years, and has experienced pandemics such as Ebola and Avian flu. He was able to provide us with valuable insight into the issues he deals with currently and in the past. Our team was also able to interview Dr. Green about his experiences working in an emergency environment in order to inform our designs and familiarize ourselves with the problem space. Key takeaway: there is often a severe lack of communication involving hospital staff, CDC, and the general public that prevent pandemics from being dealt with efficiently. To improve our understanding of Ebola, our team performed a popular media search and read numerous news articles and websites. These sources revealed different issues and dilemmas faced by government and healthcare personnel. Key findings include the spread of panic and chaos that creates further complications for hospitals and healthcare providers. There were also various innovative technological solutions proposed such as advanced scanning machines at hospitals and airports to prevent spreading of diseases, as well as robots that could provide basic care to patients. How can we utilize existing technologies to provide the public health system with better ways of dealing with infectious diseases? In order to communicate the overall feel of our desired solutions, I created a mood board from images found on the internet. These images are meant to convey the ideal feelings of trust, connection, family, safety, and health. We felt that these were some of the most important factors that needed to be provided by our designs, and putting together a collage of images helped our team think on the same page. The personas helped us highlight some important issues with healthcare in rural locations. Since the average income is relatively low compared to urban locations such as Seattle, rural citizens may feel isolated, unprepared, or unable to afford adequate healthcare. We were then able to use these personas to frame the problem from a user perspective and build an experience map. Our team created three personas of the average citizens in Walla Walla, WA. The three personas are a standard citizen, a migrant farm worker, and a college student. These personas helped us visualize the goals and needs of the types of people that may be affected by a pandemic. In order to make the personas as accurate as possible given our constraints, our team conducted online research about the demographics of Walla Walla and used information provided by Dr. Green. After we had a comprehensive map of the experience, I created a visualization in Illustrator to show stress levels over the different stages and identified key pain points where possible solutions could be integrated. This visualization helped us pinpoint the most critical stages and frame the hospital experience with relevant context. Since our team had limited experience with emergency room visits and even less so with Ebola, we worked on our personas to create an experience map from the perspective of an Ebola patient visiting the ER to help us empathize with the patients we were designing for. We mapped out stages of the patient’s journey including touchpoints, needs, thoughts & feelings, context, and insights & opportunities. Each of us generated 15 ideas for a total of 60 ideas between the team. This was done by sketching thumbnails with a descriptive title next to each one, then sharing them with the rest of the group. Because of the constraints and shared research, we noticed that there were many similarities in our ideas. This made it easier to narrow our ideas down into several categories. The next step of our ideation process required us to narrow our 60 ideas down to 6 in-depth solutions. We did this by closely examining and discussing our ideas and then identifying 6 categories of recurring themes. We then took the categories and turned them into concrete ideas as a group. Finally, the 6 ideas (location history, CDC communication, contamination avoidance, supply sharing, unified communication, and expandable quarantine) were sketched out and presented to the class and instructors for critique. The next step after narrowing our 60 ideas down to 6 ideas was evaluate them. We used a concept evaluation matrix to rate each idea on perceived importance to patients and medical staff through group discussion. These ratings were then multiplied in order to come up with a total score for each of the 6 ideas. After rating each idea, we plotted the ideas against patient importance and doctor importance. This allowed us to see which ideas were the most impactful and of high importance to both patients and medical staff. 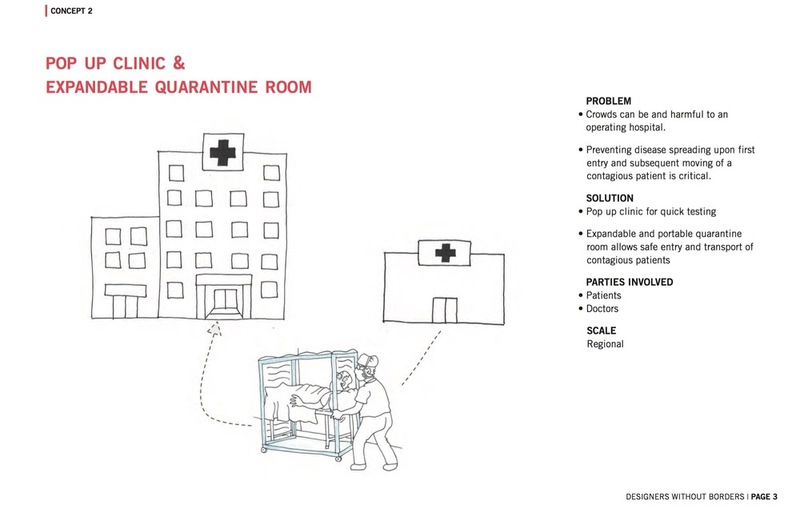 Our three highest scoring concepts were CDC communication, expandable quarantine room, and pop-up clinic. Narrowing down even further was a difficult process that required lengthy discussion in order to determine the best way to proceed, but with concept evaluation we were able to eliminate some ideas and combine others. For example, location tracking and supply sharing were merged into CDC communication. The resulting three ideas were presented once again to faculty and classmates for critique in the third week. In the final stage, we had to choose 1 of our remaining 3 ideas. This was relatively straightforward, since our feedback encouraged us to move forward with the CDC Communication concept. We developed the idea into an emergency communication system that facilitates communication streams that exchange information between the three major parties: CDC, medical professionals, and the general public. This is a unified platform that is accessible to all three parties. The CDC is able to send out cautionary updates to the public and protocol updates to medical professionals. Medical professionals can also share the latest findings on outbreak and provide medical guidance to those in need. Finally, the general public passively provides location data for infection tracking and is also able to notify medical professionals of their medical needs. The final step in our process was to refine this idea before presenting it to faculty and peers. Though not a requirement for this project, we started refining the concept by first coming up with a brand for the system that would appeal to all parties yet still capture the feeling of connection we were trying to create. Our team ended up choosing Lynk from a brainstormed list of over 20 names. Part of our process of refining the concept was to visualize the interface by ideating and wireframing. We started by designing the CDC portal, which ended up becoming a modular dashboard that CDC personnel can customize with widgets to access the most important information in any situation. By using sticky notes and a whiteboard, we brainstormed numerous possible widgets and displays and settled on a few of the most important ones to visualize in a high-fidelity mock-up. In order to help visualize the ideal scenarios in which Lynk can be utilized to effectively manage a viral outbreak, I created a series of storyboards from the perspective of the three major parties. The storyboards illustrate an outbreak scenario from the detection of a deadly virus through CDC response and notification of the general public. These were shown as part of our final presentation. Our interface mock-up of the CDC dashboard visualizes several important sources of information that CDC personnel would need to monitor in a situation such as an Ebola outbreak. The widgets provide real-time updates for incoming information and also allows the user to push outgoing information to the public, hospitals, and the press. In addition, this modular dashboard allows the user to customize the information they need to see on the dashboard by selecting from a variety of widgets or by adding a new source for incoming or outgoing information. My experience working on this project made me realize just how many opportunities there are for improvement and innovation in the public health sector. Our team identified many critical problems, but it was particularly surprising how most of the problems could be solved by applying existing technologies and systems. Going forward, I think the public health sector can and should be integrated with these technologies in order to promote efficiency and accessibility for all stakeholders. 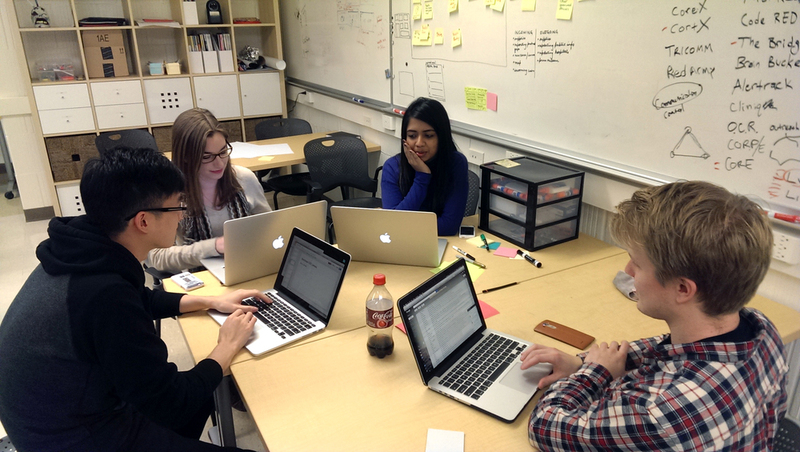 We used the four week project timeframe to familiarize ourselves with the topic, research problem spaces, and ideate potential solutions. The multi-stage format allowed us to start with broad exploration and systematically narrow down to a single concept that we then refined into a powerful product idea. The biggest challenge we encountered was our lack of familiarity with pandemics. Because of the fast-paced timeline, our project could have used more research (e.g. interviews with different stake- holders, understanding constraints) in order to design more comprehensive solutions. 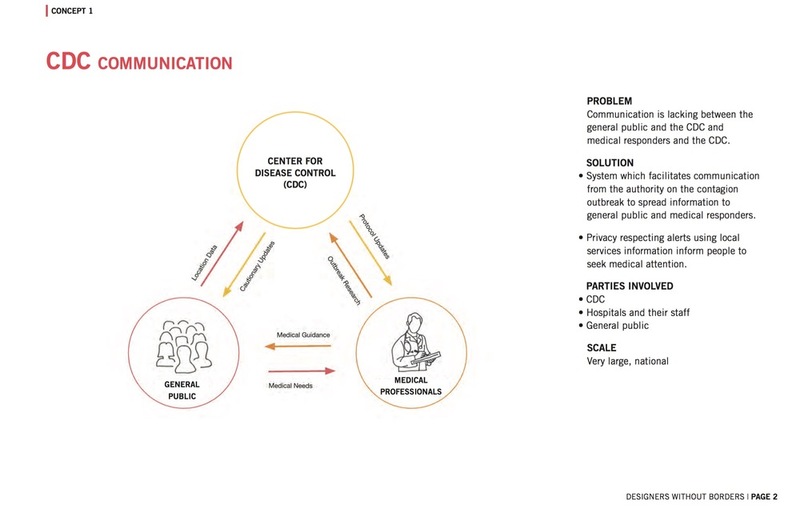 By identifying communication as the most critical part of managing pandemic situations, we found that the current public health sector is lacking a consistent and unified information sharing system. This drove us towards designing a communication platform and our end result was Lynk, a concept that we are proud to share. Future work on Lynk would involve doing further research into the types of information that different stakeholders require and we might cooperate with stakeholders in order to integrate our solution.